If one of the most populated cities in the world can integrate cycling into its streets creating safe cycle ways and public open spaces, then surely a region aiming to be Australia's most sustainable could too? This clip provides more than just inspiration. Showing how the streets of New York City have been transformed over a relatively short period of time to deliver vastly improved traffic conditions, reduced pollution, social benefits..and more , the potential for the Sunshine Coast is very real. 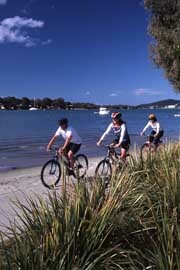 With opportunities to reconfigure existing sections of the region's road network to incorporate cycle ways for improved active transport,such measures must be part of the Sunshine Coast's ongoing and future planning.